Help! I Have No Idea What I Bought. 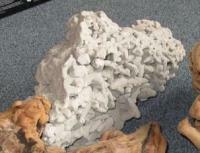 I picked up a number of fossils, minerals, and petrified wood at an estate sale. My assumption was that they were real based on circumstantial evidence (he had a lot of other collectibles that were real and expensive). I will post 3 fossil photos and one "what the @%$# is it" picture. 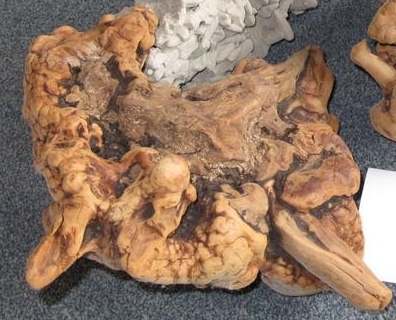 That one was supposedly petrified wood, but I cant find anything else like it on the internet. I am wondering if it is plant based or some type of other organism. The photos of the teeth and claw have a measuring tape next to it. The mystery item's are about 7"-13" long and about 6" tall. What are they and are they real. Claw was supposedly Allosaurus. Teeth are supposed to be a spinosaurus tooth and two big megalodon teeth. Also.... I was thinking about giving one to my son for his birthday unless they are worth hundreds of dollars. I am not looking for an appraisal but any ball park idea would be great. 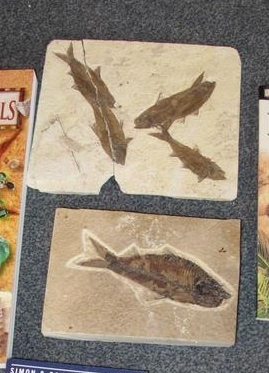 The fish are Knightia from the Green River Formation in Wyoming; the top plate can be repaired with glue .They look like they may be painted over to bring out details; better pictures would clarify. 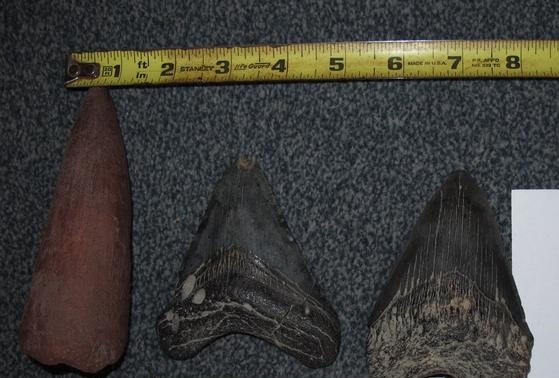 The Megalodon teeth are authentic. For the whatsits, I would take bright, crisp pictures--the third picture reminds me of "calcite sand crystals" .The Allosaur claw looks like a replica to me, although I am not an expert, as does the Spinosaur tooth--I don't see very much detail, but it's hard to tell. As far as value goes, the fish or the teeth would make great presents! The Spino and Allosaur claw look like replicas to me, but I'm not an expert. I have a Spino tooth and it doesn't look that... colorful? But like Reese said, the Megs do look to be legit. Hope we were of some help! The mistery items looks a bit like coprolite,but probably are just petrified woods.Close up pictures may help the ID. I have to agree with all these guys, the Allosaur claw does seem a bit prepped but the shark teeth look authentic. Would love some meg toothies myself! 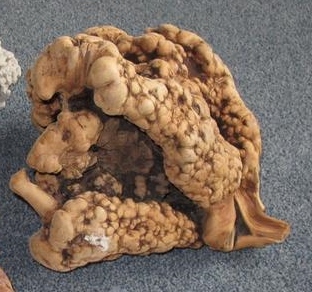 The timber looks like a burl, my understanding it is a growth that happens after some initial damage to the tree. wood turners love them. 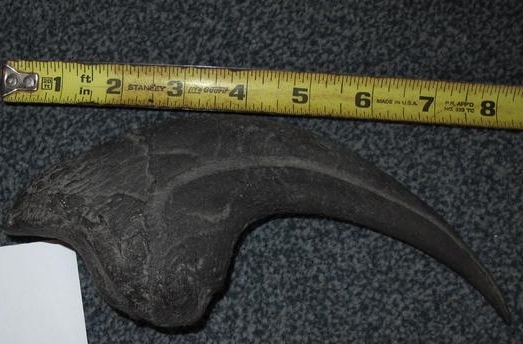 The Allo claw like the others said appears to be a replica. If real would carry a little weight and worth thousands. I have not seen replica Spino teeth since they are relatively inexpensive so why fabricate them. A better photo with more light would help. The Allosaurus claw and Spinosaurus tooth are replicas.  They resemble the replicas in the links below. Yes I agree, the Spino tooth and Allosaurus claw look like replicas. The Allo claw looks too perfect to be real and looks just like the replicas for sale all over the web. And as for the Spino tooth, it looks very strange, nothing like any real tooth I've seen. It's weird because most replicas are white to look like the tooth from the animal if it were alive. Otherwise it would be light brownish depending on how much enamel is left. This is a weird dark brown/reddish color. There doesn't appear to be any cracks or repair, so it looks too perfect to be real. But I am not completely sure. I agree with Troodon, can you post some additional pictures of the Spino tooth? The bottom fish plate is upside down. Try to burn in a corner the claws and the dinosaur teeth, so if resin will burn.